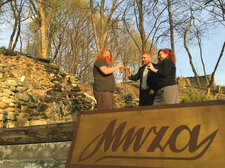 The League of Extraordinary Red Heads has its mid-year gathering -- "Fire on the Hill" -- lined up for this Wednesday, April 27 at The Hill at Muza. starting at 5:30 pm. Admission is $5 to help cover costs. As always, newcomers will be inducted into the League by receiving the coveted "Member" card. This Wednesday, the League is rolling out two new lines of official cards. Finally, for non-red haired parents, siblings, & offspring... we give you the MC1R Gene Carrier card (that would also be known as "The Redhead Gene"). While only about 2 percent of the U.S. population has red hair, about 25% of the population are "red hair carriers." We won't be requiring any cheek swabs. But this is our way of thanking all you out there for keeping the fires burning for us, so to speak. And for our other LoERH friends, fans and supporters, we give you the Member(ish) card. Think of it as a "Ginger Benevolent Association" card. The event is from 5:30-8:30 pm. Admission is $5 to help cover costs. As you might know, the founder of the league is Duncan Crary, who sometimes works with AOA on organizing events.